I just want to be clear about which of the treatments make the best hand creams for you. 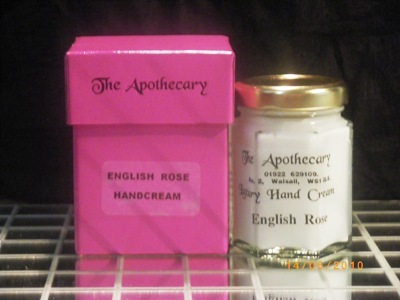 For dry or aging hands you need this English Rose Hand Cream. English Rose Hand Cream has incredible moisturising properties andnot only hydrate the skin but also leave it soft and supple. This divinely scented cream is so thick and luscious that your hands seem to almost moan with delight when you rub it in. Filled with essential oils the English Rose Hand Cream has a moisturising base to ensure that many hydrating benefits are locked in and keep on working on and on. You could be forgiven for thinking that the creaminess is what makes this such a fantastic treatment for your skin, but in actual fact it's magic lies in the oils within it. What makes this a competitor for any of the well known best hand creams is the anti oxident properties of the Rose Oil Nourishing and hydrating the skin it makes your hands so deliciously silky smooth. The rose essential oil absorbs right through the skin of you hands to the very deepest tissue and helps it to genrate new fresher skin cells. Rose oil also does a wonderful job of evening out skin tone, which is why we use it so much in our face creams. This wonderful ingredient makes it a bit of a miracle hand cream when it comes to taking years off you. Nothing gives away your age more than your hands and lighter, fresher, softer hands lets you keep that secret a little longer. Encased in a beautiful hand tooled pink box this amkes a gorgeous present of a stylish addition to any dressing table. This "must have" hand cream is priced £23 +£4 postage and packaging. Postage and packaging £4 We are happy to ship overseas.